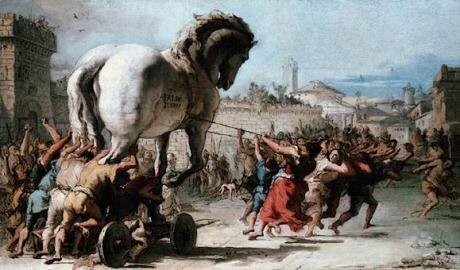 Copyright as a Trojan horse. After Giovanni Domenico Tiepolo (1773) National Gallery. Public Domain.Europe was one of the regions that connected massively to the Internet. Not only that, it was one of the few adopting literacy and inclusion programs early enough on to unleash the power of connected citizens, showing them how to create new business models and improve education but also how to express themselves, create, organize and protest. But alarmingly, the European Parliament is on the verge of a dramatic change of direction. The EU has recently embarked on a new mission: controlling the Internet through the monopoly of copyright. This attempt to reform and control the Internet has not received half the attention it deserves. As Julia Reda, MEP for the Pirate Party, has explained, the current project of EU legislation would impose automatic filters that control ANY content that anyone wants to upload. The reason would be the protection of copyright, a monopoly right that primarily benefits large media behemoths, without any possibility of advance verification. In DiEM25, we do not see this as just an outdated law, isolated from current politics. Indeed, that is precisely what is most worrying about it. We cannot see it as unconnected to the big push in Europe by authoritarian leaders wanting to restrict, to truly shrink the spaces of civil society. Increasing censorship online will reduce the ability of citizens to say what they think, filtering content before it is published. This will not only harm speech but increase surveillance and the meting out of punishments for things we say online. This is combined with all the existing online state surveillance already endured by EU citizens, which remains as powerful as ever. With dismay, we are witnessing now an open boycott of the democratic achievement of a connected Europe. The European Parliament Legal Committee has just given the green light to a law that will be a tool to control speech, expression, criticism and increase the surveillance levels imposed on all EU citizens. Disguised as a copyright reform, this is is a move to remove power from the hands of people and silence voices. Diem25 stands against it and urges all progressive MEPs to reconsider their position. Otherwise, be prepared to wave goodbye to free speech, because you may want to use something that someone claims “exclusive rights” on. And while you are at it, say Bye, Ciao, Adios to democracy. Because of free speech. Free speech is a fundamental right, right at the heart of any democratic system. If you can’t say a word, before checking if someone else has a publishing monopoly on that word (and don’t forget there is no way to check this), you effectively abolish free speech. Copyright dates from the days of the printing press, when copying was difficult and expensive. It ensured a distribution monopoly for businesses who would distribute content that was hard to gather, hard to assess, hard to distribute, and hard to market. Let us shift the vote on July 5 and create a space to discuss the democratic future of the Internet. But we live in the 21st century, not the 19th. The Internet changed all that. Yet, the distribution monopoly holders want to keep their rent-seeking practices, to benefit from the creative work of the real authors and creative people. And the European Parliament looks like they want to support the monopoly holders over the rights of democratic debate and free speech. - First, it has the balance between monopoly, expressed through copyright, and freedom of speech fundamentally wrong. As Europeans we expected our representatives to be designing the institutions of the future, not relying on and constructing all the architecture for our shared information based on outdated nineteenth century copyright laws. - Second, there has been no proper debate about this. DiEM25 is the one political movement that is adopting a serious, crowd-sourced approach to issues such as the relationship between technology and free speech, through its current adoption of its Seventh Pillar on Technological Sovereignty in its ‘Progressive Agenda for the Internet and other technologies in Europe’. Remember the Cambridge Analytica scandal? DiEM25 is the only political movement with a structural approach to this problem. Rather than the sad cosmetic media-shows we’ve seen in the European Parliament. - Third, from a democratic and transparent perspective, we need to take back power over technology. Technology is great, but it is we humans who must have a democratic control over it. Europe won’t be democratised without democratising its technologies. The future of democracies, economies, the environment, public life, equality, freedom and justice are entwined with the futures of technologies – and vice versa. Join us in shaping the policies for a democratic future and send us your proposals. Meanwhile, call your MEP to block this awful “copyright reform”.